Hey guys! 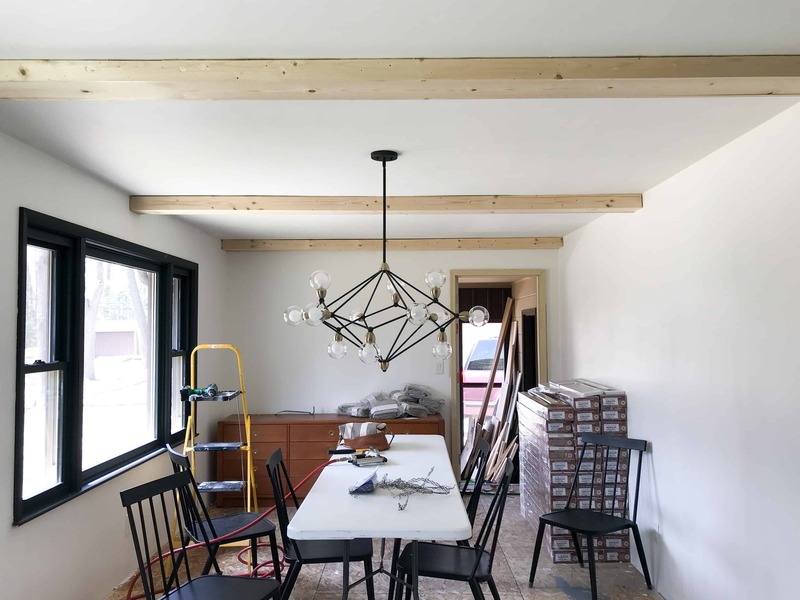 Last week I revealed my finished dining room and kitchen, but I wanted to give you more details about those wood ceiling beams! 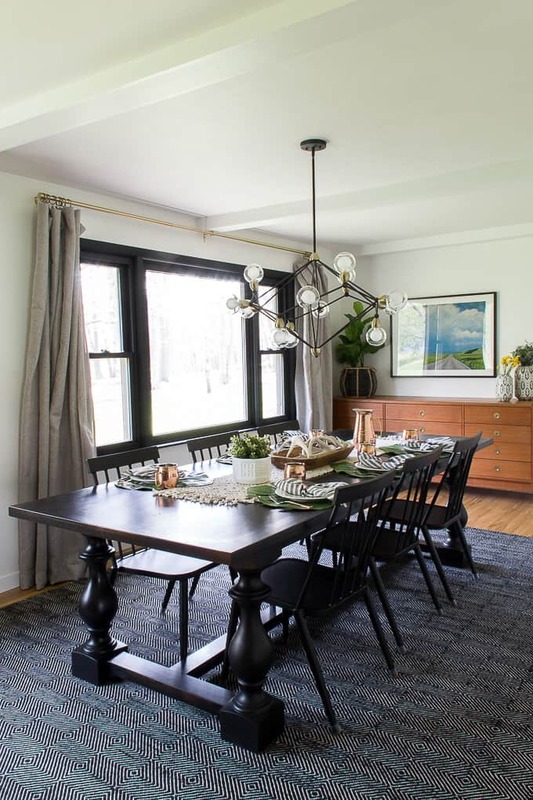 Today I’m sharing the lowdown on how to install faux wood beams. 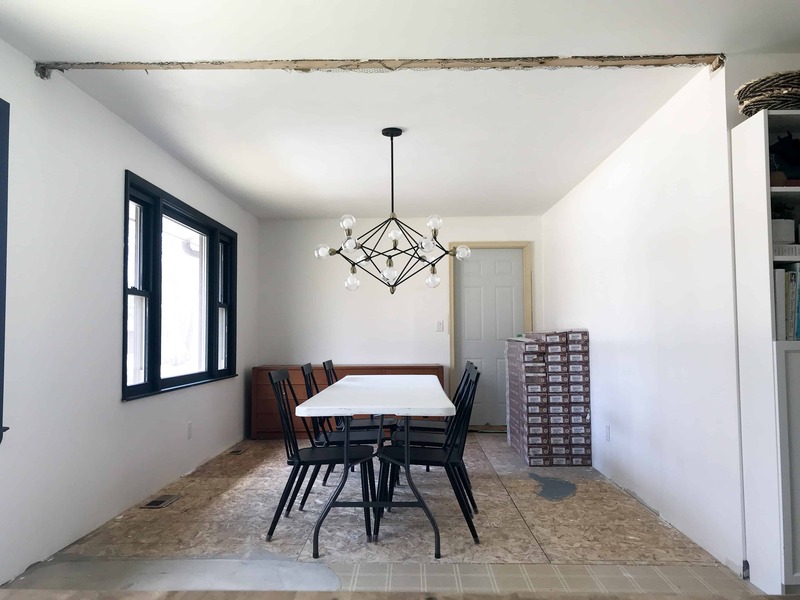 In case you’re new, this is how the dining room looked before! After tearing down the track lighting, and the box that was supporting it, I realized the the ceiling heights of the two rooms were about an inch off from each other! I wanted to just drywall the seam, but this was WAY too big of a different to drywall over. 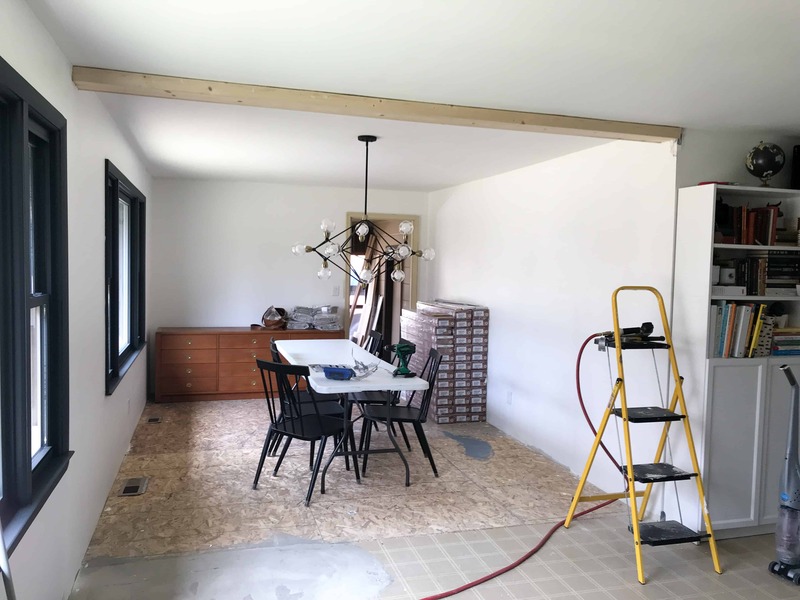 I could have installed an entire lower ceiling in the dining room to meet the other ceiling, but that was far beyond what I had planned on doing. 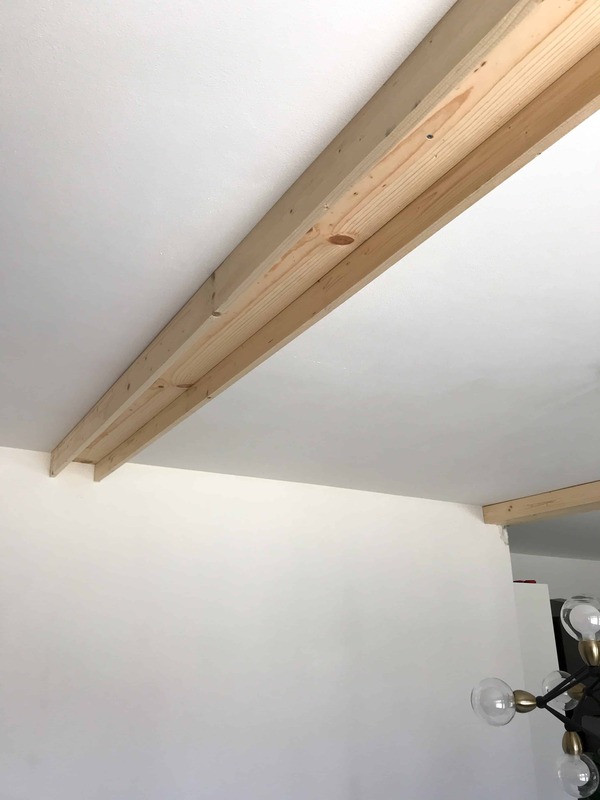 I screwed another 1×6″ board to the ceiling, and then used my brad nailed to attach the faux beam to the board on the ceiling. Believe it or not, I was able to do this 100% on my own!!! My husband was at work and it wasn’t that heavy, the hard part was holding it AND nailing it alone. In total I built three beams. I considered staining them, but due to all the gaps that I wanted to caulk, this would have been much more difficult. So I went to town caulking all of the gaps. I ended up using five tubes of painter’s caulk! Then once they were dry I used the same color as my walls and ceilings, Benjamin Moore “Chantilly Lace”. Although the don’t “pop” I think they add a nice architectural element to the room. 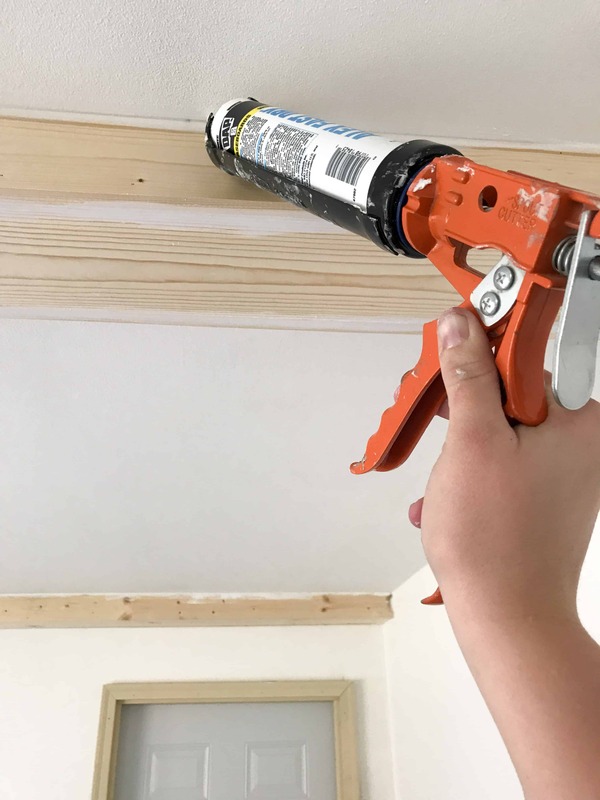 It also saved me from having to install an entire second ceiling! If you’re looking to add something to a room, these faux wood beams are an affordable and simple way to do it! I was able to complete this entire project, from building, to caulking, to painting all in one long day! I hope this post inspired you and taught you a new skill! Maybe you want to add some contrast to your ceilings, or have something you need to cover up? Either way I’m thankful that you’re here! Have a wonderful day! I’m glad you revisit your reveals. It all went so fast I wouldn’t mind a post on how to pick hardware. How to pick appliances. Or some variation. Even how to make sure your new drawer handles are straight. Just to let us enjoy your room while learning as I did with this post. 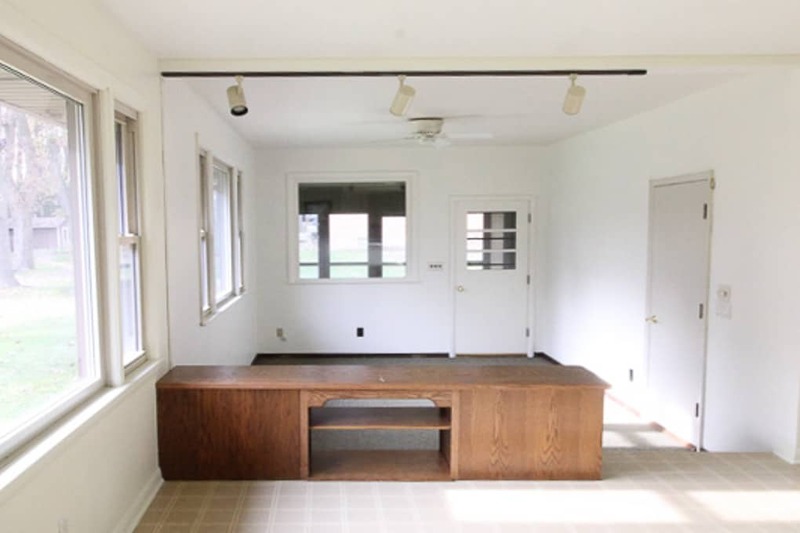 I actuall Thought you were a modern trend setter doing painted beams. It makes your windows stand out and makes the beams add interest. Thank you!! Aw thank you! There was so much to do in such a short amount of time that I had to revisit! 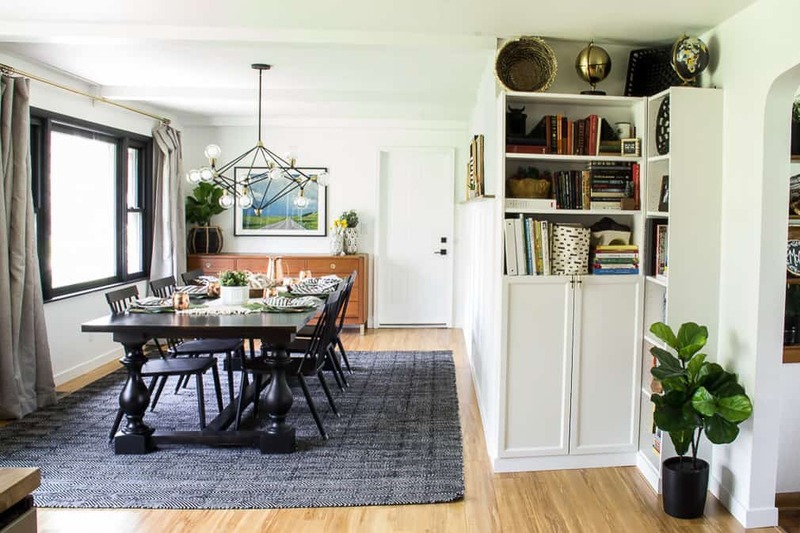 I still want to add some crown molding on the bookshelves before I share all the details about those too! I shared one hardware post a while back but it was more specific to bathroom hardware, here is that link: https://www.brightgreendoor.com/brass-hardware-and-brass-fixtures-for-the-bathroom/. Also I’m so glad you love the beams! boy… how bout you come to y house and help me! Ha! I wish that I could! 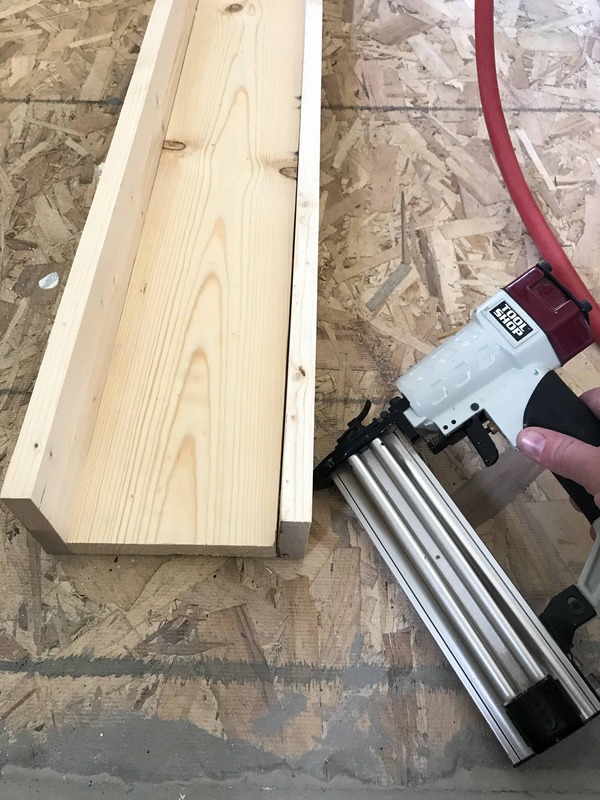 Wouldn’t it be great if we could all connect and DIY together?